Cut pork into 1/2" cubes or strips. Place remaining ingredients in a blender and blend until evenly mixed. Marinate pork in this mixture for several hours to overnight. Thread pork on skewers and grill over hot coals for eight to 10 minutes, turning occasionally, until done. 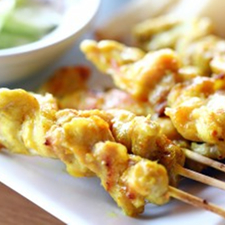 If using bamboo skewers, soak them in water for one hour and cover exposed portion with foil to prevent burning. Per Serving (1/4 of recipe): 238 Calories; 11g Fat (43.3% calories from fat); 3g Saturated Fat; 27g Protein; 7g Carbohydrate; 1g Dietary Fiber; 74mg Cholesterol; 399mg Sodium. Exchanges: 0 Grain(Starch); 3 1/2 Lean Meat; 1/2 Vegetable; 0 Fruit; 1 1/2 Fat; 0 Other Carbohydrates.